Built by William Erwin, for whom the town of Erwinna is named, it was part of the original 1681 land grant given to William Penn by King Charles II of England. A portion of the house was constructed in 1800 and another wing in 1820. In 1846, the home was sold to local miller Henry Stover. His son, Jacob, added another wing in the 1860s. The house is an excellent example of both the Federal style of architecture (the original section) and the Victorian style (later additions.) The Stovers held the house until 1955 when descendants gave the property and 126 acres to become Bucks County’s first public park. The 1850’s era barn is used for public and private events. 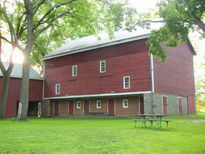 The house and barn are located on the grounds of Tinicum Park.